Voice of Revolution urges all to reject the confines of the existing set up, which limits elections to the politics of the rich and candidates, like Obama and Romney, vying to be champions of the rich. Vote anti-war candidates instead and make certain that work for the independent politics of the working class is stepped up. Election day is not a time to end political debate, it is a day to ensure that the politics taken up and the debate organized are those of the working class. It is a time to organize for rights, including the right to be elected to office, the right to govern and decide. In a situation where such grave problems as climate change, aggressive war, massive unemployment and poverty confront the people, the best the politics of the rich can come up with is a campaign of negative ads spreading fear and doubt. People are not only disinformed about the actual problems that exist and how to solve them. They are discouraged from even engaging in politics. It is estimated, for example that only about 48 percent of people under age 30, will vote. Many people are also contending with voting not for someone who represents them, but rather against someone. Negative ads with their “big lies,” are consistent with this limitation. The election campaigns of the rich are used to undermine organizing efforts by the workers themselves guided by the fight for the rights of all, as seen in the recent Chicago teachers strike. The teachers put renewing their defense organization on the agenda, including organizing to unite parents, students and teachers in the fight for the right to education. They took their independent stand against Obama’s Race to the Top and other administration measures serving to wreck public education. And they did so despite great pressures not to oppose Obama and his man in Chicago, Mayor Rahm Emmanuel. An independent stand defending the rights of all was taken and affirmed by the strike. Participating in elections also involves taking an independent stand and rejecting the confines imposed by the rich. These confines say that it is Obama, for example, who can “create space” for change. In fact it is the conditions themselves, and the conflict between these conditions and the existing state authority, that create the space for change. The battle then is who will occupy this space, the rich or the workers? Without advancing the independent politics of the working class and its alternative for a new direction for the economy and political affairs, it is the rich and their champions who will occupy the space and use it against the interests of the working class and people. Instead let the elections be a time for serious debate about the necessity for a new direction and the practical steps needed to accomplish it. Among these are discussions large and small, in public and in homes, in classrooms and break-rooms, on the need for the independent politics of the working class and worker politicians to represent the anti-war, pro-social agenda of the working class. It includes fighting for public financing of the process, not the candidates. It means organizing among our collectives to be informed — on how to deprive the rulers of power and how to empower the people themselves to govern and decide. 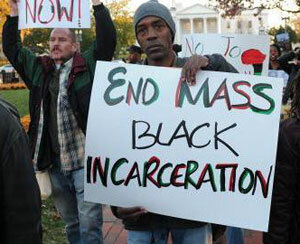 The U.S. government utilizes mass incarceration as a means to broadly repress and disenfranchise African Americans. It is the genocide of the present, a genocide that is intensifying yearly. The United States prison population has grown every year for the past thirty-six years. The rate of imprisonment in the United States is now four times its historic average and seven times higher than in Western Europe. 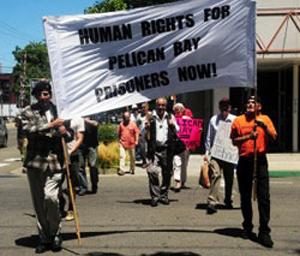 To return to 1970s levels, four out of five prisoners would need to be released. Further evidence of the intensification of use of mass incarceration is the fact that at least 60 percent of those imprisoned are there for non-violent offenses, many of them minor like possession of small amounts of marijuana. As well, according to a recent Pew study, prisoners released in 2009 served an average of nine additional months in custody, or 36 percent longer, than similar offenders released in 1990. Overall the United States has less than 5 percent of the world’s people, yet accounts for 25 percent of the world’s prisoners — currently more than two million people and growing. The racism of the U.S. state, known for its hundreds of years of slavery, is seen in facts like one-third of African American males, under 40 and forced out of high-school are currently behind bars. Among all African American men born since the mid-1960s, more than 20 percent will go to prison, nearly twice the number that will graduate college. Six million African Americans are now denied the right to vote as a result of this genocide of mass incarceration. In the U.S, African Americans have long played a vital role in militantly resisting oppression and fighting for progress. They are recognized by the ruling circles as a significant force in the fight for rights and are singled out for massive repression. Genocide is a weapon of mass destruction practiced against whole peoples and collectives. It is government use of force to destroy cultures and memory — of resistance, of social development and contributions. 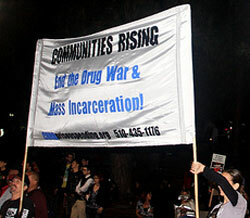 The large majority of people across the country have expressed their outrage at the racism and government profiling of the U.S. state and demanded an end to mass incarceration. 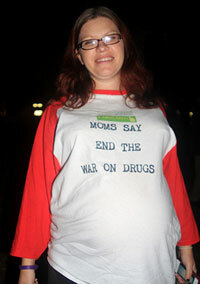 The rejection of the so-called war on drugs, used to justify this genocide is also widespread, as can be seen in the referendums in three states (Colorado, Oregon and Washington) to decriminalize marijuana. Similarly the government war on immigrants is also being rejected. Workers are together standing for rights and for progress. Their vision for society is not one of use of force against the peoples but one of defending rights. Our future lies in the fight for the rights of all. This direction is what needs to be debated and taken up for solution so as to eliminate the genocide of mass incarceration. The issue of mass incarceration is not on the election agenda of the rich because they cannot address the fact that they cannot provide solutions to social problems, like inequality and mass repression. Faced with deepening economic and political crises, and blocking the path forward, U.S. rulers can only resort to violence as their weapon of choice. Mass incarceration and policies like Stop & Frisk and mass deportations are all intensifying, as repression is the only response to a class that cannot go forward. 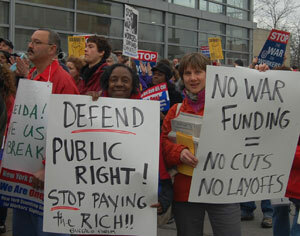 The working class has an alternative for a new direction for the economy and political affairs. It calls for stepping up the independent politics of the working class, guided by the fight for the rights of all. It is these independent politics that can and must be advanced — during the elections by refusing to vote for the pro-war politicians of the rich and afterwards, by continuing the debate comparing the answers of the ruling class and the alternatives of the working class. Why is this not a front and center issue in the presidential campaign? Nonviolent offenders are 60 percent of our prison population. If we wanted to return to 1970s level of incarceration, we would have to release four out of five people behind bars today. The United States leads the world in the rate of incarcerating its own citizens. We imprison more of our own people than any other country on earth, including China, which has four times our population, or in human history. And now, a new Pew report announces that we are keeping even nonviolent inmates behind bars for increasingly longer terms. This comes at a time when soaring costs of prisons are wreaking havoc on federal, state and local budgets, as schools, libraries, parks and social programs are slashed. When I graduated from the University of California at Los Angeles in 1983, my state spent more on higher education than prisons, a lot more. That equation is now reversed. Money that could have gone into reducing skyrocketing tuition and cuts to education has instead gone to prisons and inmates. Over the past 23 years, California constructed roughly one new prison per year, at a cost of $100 million each, while it built only one new public college during the same period. Nationwide, spending on prisons has risen six times faster than spending on higher education. As I protest education cuts, I am so often told, “We just don’t have the money.” It is a lie. We do have the money. We just choose to spend it on prisons. Forced to “check the box” on job applications that they are convicted criminals, even those who have had simple convictions like marijuana possession are often legally discriminated against by employers. An unemployed young man recently wrote to me about being shut out of his dream job, nursing, because of a decade-old marijuana offense. In fact, no one at all will hire him. As he languishes on a friend’s couch, he is hopeless, depressed and suicidal. Here is one stark way to understand our new normal of mass incarceration: If we wanted to return to 1970s levels of incarceration, we’d have to release four out of five people behind bars today. Nonviolent offenders are 60 percent of our prison population. Releasing half of them would free up nearly $17 billion per year for schools or other worthy programs, with no appreciable effect on the crime rate. In fact, many studies conclude that mass incarceration is crimogenic, i.e., locking up people for minor offenses increases crime because they become hardened behind bars. Since few prisons offer therapy or vocational programs and children left behind in fatherless homes are more likely to grow up to become offenders themselves, the problem just gets worse. But we cannot keep going down the road of locking up more people for longer amounts of time. According to Pew, prisoners released in 2009 served an average of nine additional months in custody, or 36 percent longer, than offenders released in 1990. Annually we now spend $68 billion and growing on local, state and federal corrections. Why does the right not consider our multibillion-dollar prison system to be the type of bloated government program ripe for cost-cutting? Why is the left so rarely concerned about the warehoused young lives and the destruction of inner city families from our culture of mass incarceration? Numerous demonstrations and other actions have been held in New York City against the racist and criminal police practice of Stop & Frisk. The NYPD stopped and searched 685,000 people in 2011. Police arbitrarily stop youth who are guilty of no crime on the streets. The youth, the large majority African American or Puerto Rican, are harassed and often frisked then arrested on trumped up charges like resisting arrest. Stop & Frisk is used as a pipeline for mass incarceration, which in turn serves to repress resistance and organizing among the youth and national minorities more broadly. Four organizers against Stop & Frisk are currently on trial in Queens for a demonstration last November 19 at the 103rd precinct police station. They face two counts of Obstruction of Government Administration, and one of Disorderly Conduct. Each obstruction charge carries a possible sentence of 12 months in prison at Rikers Island. More than 1,000 people have signed a petition demanding that charges be dropped. Many have testified at meetings and City Council hearings to the brutal and racist treatment by police implementing Stop & Frisk. 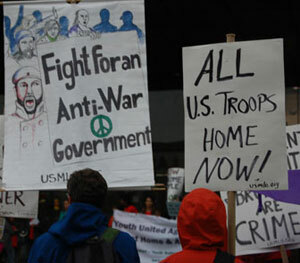 Protests against it have escalated over the last year. The Bronx District Attorney has recently ceased prosecuting many trespass charges associated with the policy. But Richard Brown, the Queens District Attorney has intensified efforts to convict and punish protesters. While hurricane Sandy postponed the trial, the Queens prosecutors are now proceeding. Jamel Mims, one of four defendants in the case said, “The subways are flooded and in limited operation, but the courts and the political railroads remain flooded with people and continue operating on the fast-track.” The trial is set to resume November 5. As with most trials of this kind, where the police are attacking the right to protest and organize, the prosecutors make every effort to deny the trials are political. 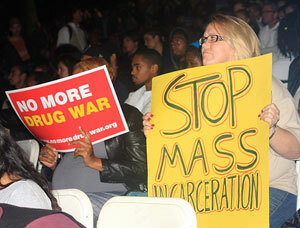 Prosecutors have demanded that discussion of Stop & Frisk and rights to protest be excluded. Judge Gene Lopez has repeatedly instructed the 6-member jury that “Stop & Frisk is not on trial here.” He also recently ruled the defendants will not be allowed to explain the purpose of the protest and their motivations to the jury. As one defendant responded, “It’s true that we’re the ones that could get locked up for protesting. 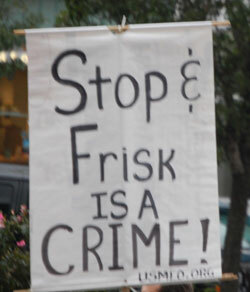 But Stop & Frisk is on trial all over the city right now. The verdict is that it is racist, unconstitutional, and unjust.” This was underlined by dozens of people recently testifying at Brooklyn College about abuse they had suffered during NYPD stops and searches. The NYC City Council was holding a public hearing on Stop & Frisk. Undeniably, the convicted felon and ex-felon populations are two of the least politically popular groups facing disenfranchisement, potentially making their case for participation in democracy the most difficult. Opponents deploy a number of arguments against this crucial step toward universal suffrage. Some argue that if someone chooses not to follow the law, then he does not have the right to help select those who make the laws. They say that the right to vote is one that can be taken away as punishment — even well after an individual has completed her sentence. Voting is essential to a valid democracy. It is both a right and a duty — not a privilege. It is fundamental to the rigorous and diverse discussion required by our society. Yet this November, nearly 6 million citizens will be barred from the voting booth, silenced and ostracized. This number begs the question: how can this be right? With elections approaching, some of us find ourselves confronted with contradictions and conflicted impulses around whether and how to participate in an electoral system that often proves itself unresponsive to people’s aspirations to live our lives free from the violence of policing, imprisonment, surveillance, and social and economic oppression. We may bristle at or reject the false choices suggested by the idea of the “lesser of two evils.” We may be firm in believing that the ultimate solutions to our social problems will not come from politicians but from the people. Yet we may also wonder about how we can or are forced to engage with electoral politics. What are the different scales at which elections affect our lives? How is voting for president of the United States different from voting in local city council races or for or against state initiatives, some of which deal directly with Prison Industrial Complex (PIC) issues? And what about those of us for which voting is not even an option? No prisoner ever won their liberation by voting to be free. When it comes to the pros and cons of electoral politics (whether from the right or the left), 2.5 million imprisoned people are largely disappeared from the conversation. Many millions of former prisoners are barred from voting as well. No victim of police violence has ever been offered an opportunity to vote out the cop who has beaten them or killed their family member. Migrant workers and their families have no electoral recourse when ICE is barreling down on them. The limits of electoral participation become even clearer when we consider that voting rates in communities of color since the mid-1990s have increased right alongside the increase in imprisonment rates in those same communities. While legislation is being passed to criminalize immigrants in state after state, immigrant enfranchisement is not even on the table for discussion. Anything politicians can grant they can also either take away, or make largely irrelevant to people’s day-to-day lives. It is important to acknowledge that engagement in electoral politics is not simply voting. It also involves communicating with our families, friends, and coworkers; analyzing issues; doing political education in our communities; and finding ways and spaces to pressure elected officials after the elections are over. For Critical Resistance, given when, where, and how we do our work, we hope we can take every opportunity to build awareness around the PIC and organize neighborhoods that have been the most devastated by it and make critical connections between people’s day-to-day experiences and the political structures that so frequently ignore demands for liberation. For our work to be successful, “meet the people where they are” must be more than a slogan, but a practice that helps to keep organizations grounded in lived realities. In 2008 over 130 million people voted and many others — some not even eligible to vote because of imprisonment, felony status, or age — played a part in the electoral process by communicating their ideas and opinions, volunteering, donating, registering people and demonstrating for and against candidates and initiatives. Continuing to activate people is crucial to building our movement against the PIC. And reaching people and making demands is just the beginning. This political moment — whether we choose to, are able to, or are allowed to vote — is one during which to think about the meanings of political organization, choice, power, possibility and freedom; about what the future holds and how we can be our own liberators.